Roasted Potatoes with Green Garlic, Mascarpone, Thyme For Cooking easy sides. 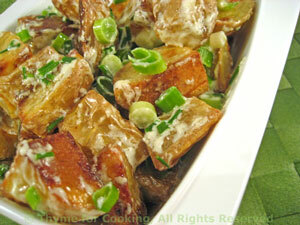 Roasted potatoes are finished with green garlic and creamy Mascarpone cheese for a slightly decadent spring dish. Put 2 tsp of oil into large bowl, add potatoes and toss, coating thoroughly. Trim green garlic and slice, using as much of the green tops as reasonable or trim and slice green onion and mince garlic. Mix remaining 2 tsp oil, green garlic (or onion and garlic) and mascarpone in large bowl. When potatoes are done, add to bowl and mix well. Either serve immediately - or put in an oven-safe serving dish and keep warm in a low (200F, 100C) oven for up to 15 minutes.